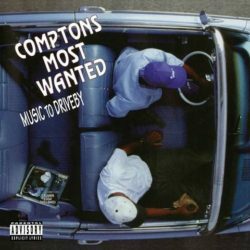 There are West Coast classics, and then there is Music To Driveby, the third LP from the group that birthed MC Eiht: Compton’s Most Wanted. Although the group started in the late ‘80s with multiple MCs (including Tha Chill and Boom Bam), by 1992 Eight was pulling the group’s vocal weight – supported by DJ Mike T on turntables and production – and even producing and co-producing tracks. Music To Driveby might lack beats-per-minute variety, but to fans that’s not a bad thing. Elsewhere, Eiht rolls alone and intensely, on cuts like the classic smash single “Hood Took Me Under”; the album’s second single and Tim Dog attack “Who’s Fu**ing Who?”; the hometown big-up “Compton 4 Life”; and hustle tales like “Jack Mode” and “I Gots To Get Over.” After this album, Eiht released more classics under his own name, and with similar fan worship. It was the continuation of a legendary career and Music To Driveby still ranks high on anyone’s “West Coast Legends” playlist.